Welcome to the official website for Up Helly Aa, which takes place in Lerwick, Shetland, on the last Tuesday in January every year. Up Helly Aa day involves a series of marches and visitations, culminating in a torch-lit procession and the burning of a galley. 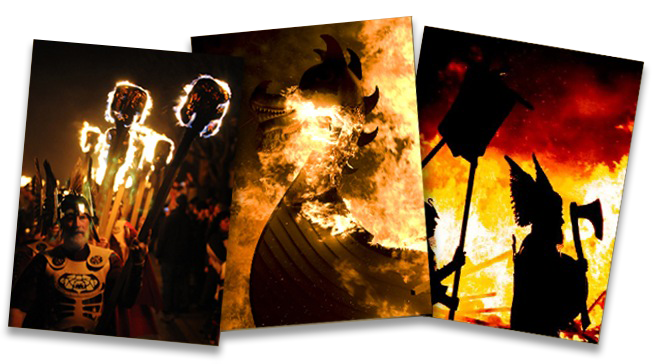 Up Helly Aa is a community event, with countless volunteers contributing many hours each winter towards organising and planning the following year's festival. The Guizer Jarl and his squad begin their preparations in February, and many long hours of hard work go into the design and production of their fabulous outfits. The Up Helly Aa Committee begin their year preparing the Up Helly Aa Exhibition that runs from May until September in the Galley Shed. This boasts a full size Galley, Jarl Squad suits, other Squads memorabilia and an extensive collection of photographs recording the suits worn and the guizers involved. In early September the Guizers of the remaining 46 squads begin their squad meetings and preparations. This involves determining the character(s) that they wish to portray with their suits, making the suits while also creating and practising their act to perform in the halls they visit through out the evening. At the end of September the Galley shed is transformed back into to a working shed where the Galley and the torches are constructed during the winter. During this same period the Committee progress preparations including the Collecting Sheet and Bill. We hope you enjoy the site and the information it provides.